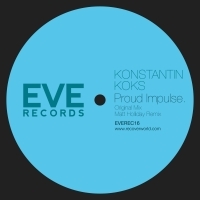 Returning to EVE Records for 2014 is Russian producer and DJ Konstantin Koks with 'Proud Impulse'. The original mix walks the line between minimal and tech-house, with enough tribal beats to spare and some truly unmissable progression which rumbles on throughout. Fellow EVE Records artist and DJ / producer superhero Matt Holliday joins us once again on the B-side with a spectacular remix which adds a tasty layer of his characteristic filth to the mix. 'Proud Impulse' is available now from Beatport and iTunes.